Hello from Orkney, where I'm currently on holiday and blogging from a lovely self-catering apartment in Kirkwall. As I've got plenty of time to relax and have been spending a lot of hours travelling I've been able to catch up on some reading after a few weeks of not having much time or energy to get stuck into a book. After finishing Hex I moved straight on to The Fire Child by SK Tremayne. Lots of you will probably have seen the same author's previous novel The Ice Twins in bookshops, WHSmith's and even supermarkets, as it appeared to sell very well. I reviewed that one here. As you can probably tell from the title, The Fire Child is not much of a departure in style from The Ice Twins. Like its predecessor it has at its heart a young woman battling with her own psychological demons and faced with caring for an enigmatic, possibly disturbed child in an isolated setting and with a husband she isn't entirely sure she can trust. This time, the setting is a Cornish mansion belonging to the ancient Kerthen family. The current master of Carnhallow is David Kerthen, a super-rich corporate lawyer, whom the protagonist Rachel has married after a whirlwind romance. She's also become stepmother to Jamie, David's eight-year-son. David's wife Nina, Jamie's mother, was killed only eighteen months previously in a terrible accident in one of the many disused mine shafts that surround Carnhallow and which were once the source of the Kerthen fortune. Rachel is a working class girl from a south London council estate who has somewhat reinvented herself and has been struggling to get by lecturing in photography prior to meeting David. Besotted by her handsome older husband and overwhelmed by the beauty of Carnhallow, she frequently feels lonely and out of her depth, particularly as Jamie is withdrawn in her presence, David is in London for most of the week and the house is packed with constant reminders of chic, capable, captivating Nina. When Jamie begins to claim his mother is still somewhere in the house, and starts to show signs of the second sight the Kerthen men are reputed to possess, Rachel begins to wonder if he's seriously disturbed - or is it, in fact, Rachel whose sanity is in question? 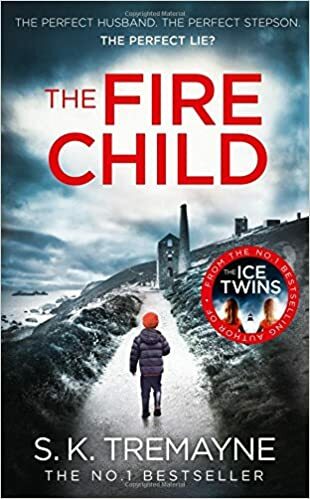 One of the great strengths of The Fire Child is its powerfully atmospheric description of the Cornish landscape - beautiful, yet harsh and intimidating in its rugged wildness - which is brilliantly done throughout. SK Tremayne also does well in evoking the peculiar oppressiveness of history. The weight of hundreds of generations of tradition, pride and, in fact, cruelty sits heavily on David Kerthen's shoulders and is as much an intrusion into Rachel's marriage as the dead Nina. If you're thinking the story has echoes of Daphne du Maurier's Rebecca, you'd be right; there are several similarities between Rachel's situation at Carnhallow and the second Mrs De Winter's plight at Manderley and I think it works well as homage rather than imitation. The characterisation was, for me, something of a problem in this book. David is indeed rich and handsome, but his supposed appeal was lost on me. Someone who demands his martinis 'faintly poisoned with vermouth' and claims not to know how many bedrooms his house has is not a charming sophisticate: he is smarmy and pretentious, and Rachel, who is an intelligent woman of 30 and not a naive young girl, should be more than capable of realising this. I also struggled with Rachel as a character. There are inconsistencies that can be explained away by the eventual outcome of her storyline, but there are also some quite fundamental things that don't see to ring true to me and some minor things that are directly contradictory - a redhead, she claims her freckled Celtic skin 'never takes a tan' and then refers a few pages later to her 'tanning shoulders'; she says the only alcohol she likes is port having previously referred fondly to her champagne-fuelled dates with David. Her desire to form a bond with Jamie is essential to the plot and to later revelations, yet just doesn't ring particularly true for most of the book and isn't borne out by her behaviour towards him on a practical level. That said, as the book progresses SK Tremayne does a good job of conveying Rachel's mental state. This is a novel full of dark secrets and shock twists. Despite my issues with the characters, it is absolutely a page-turner and the pace is perfect. It's tense and chilling and has a touch of the modern gothic about it. I do, however, think the final big revelation is just too much of a stretch of plausibility for me - I obviously don't expect gritty realism from this kind of book, but I do need to be able to read without rolling my eyes, and this was a moment where the tension was broken for me as I simply stopped being able to suspend disbelief. There also are too many elements that can't adequately be explained away by what unfolds at the end. Also irksome is an incidence of violence against a woman which, while taken appropriately seriously in the story at the time it occurs, is later handled by the author in a way I found rather dismissive. I did enjoy reading this book, despite its flaws, and finished it very quickly, which is usually a good sign. Although I didn't think it was quite as good as The Ice Twins (which has the edge for me simply because of its superior and more original premise) it was a good holiday read overall. Thank you to the publisher for sending me a copy of The Fire Child via NetGalley on the understanding that I would provide an honest review.